​Cycling is a great sport, and anyone can do it. You don’t need to be a fitness enthusiast, a long-time bicyclist, or even in decent shape to get started. That’s one of the great things about cycling: it can help absolutely anyone improve their health, have a positive impact on the environment, and pick up a fun new hobby. But getting into cycling can be intimidating. That’s why we’ve put together this beginner’s guide for you. It will introduce you to the topics you need to know about, tell you the basics, and show you where to get more detailed information. 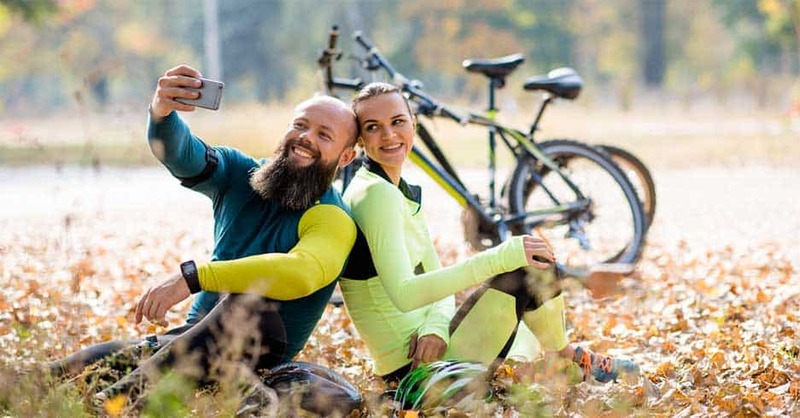 ​Why Choose Cycling? It Will Improve Your Life! With all of the other great sports and activities out there, you might be wondering why you should try cycling. Isn’t cycling the domain of rail-thin professionals that spend tens of thousands of dollars on their bikes? Well, that’s part of it. But the cycling world is so much bigger than that. People who are fit or unfit, young or old, new or experienced, can enjoy cycling. You can ride anywhere, from the neighborhood bike paths to the highest mountain passes. You can take a quick ride down to the grocery store or go on a months-long adventure. It can be a practical activity, used for running errands and going places while saving money on gas and making a smaller environmental impact. Or it can be a fitness activity to to help improve your health and quality of life. ​The best part about cycling, though, is that it can be both. A 2017 study showed that cycling to work can have huge health benefits, including a lower risk of cardiovascular disease, cancer, and mortality. And that’s just cycling to work—imagine if you rode to get groceries, rode with your kids on the weekend, and rode to the local brewery to meet friends. The health benefits are enormous. And cycling gives you a well-rounded workout. The extended time you spend pedaling works your aerobic system, which burns fat, increases your endurance, and improves your heart health. Short bursts up hills and at faster paces improve your muscular strength as well. There are even some bone-building benefits, despite the low-impact nature of the sport. Numerous studies have also shown links between cycling and mental health. Even 15 minutes of cycling can help reduce stress. Cycling can stimulate the brain, helping improve memory, reasoning, and other cognitive skills. It even helps increase the connections between white matter cells in the brain, which has all sorts of neural benefits. In short, cycling improves all facets of your health, from your bones to your brain. ​Riding a bike is much more environmentally friendly than driving, too. That’s great when you’re commuting on your bike, but what about if you still drive to work? Even then, your bike can help you decrease your environmental footprint. A quick ride to the library or the grocery store every now and then adds up. So does not driving to the gym for your workout. cycling can save you money. Getting into the sport isn’t always cheap, but riding your bike requires a smaller investment than driving your car. You don’t have to pay for gas. You can even save tax dollars by riding your bike. Pollution, accidents, congestion, and road wear all cost local governments money. By reducing all of those, you’re decreasing the financial burden on your city—which means you pay less in taxes. ​If you live in a country where most people don’t ride their bikes on a regular basis, all of this might seem a bit foreign to you. ​But it’s worth noting that Denmark, consistently rated one of the happiest countries in the world and one of the best places to live, is also one of the most bike-friendly places. A full 50% of Copenhagen’s residents bike to work or school on a regular basis. And, of course, there’s another factor that’s more difficult to quantify: riding a bike is fun. The pavement or trail under your wheels, the wind blowing against your face, the intense effort to get through a tough ride, the contentment from doing something good for yourself and the environment . . . it’s almost impossible to explain it to someone who doesn’t ride regularly. But it’s there, and it’s real. The joys and benefits of cycling could take up an entire book. We’ve really only scratched the surface here, but it should be obvious that cycling is a phenomenal activity, and one that more people should take part in regularly. Ready to get started? Then let’s dive in and get you introduced the world of cycling! 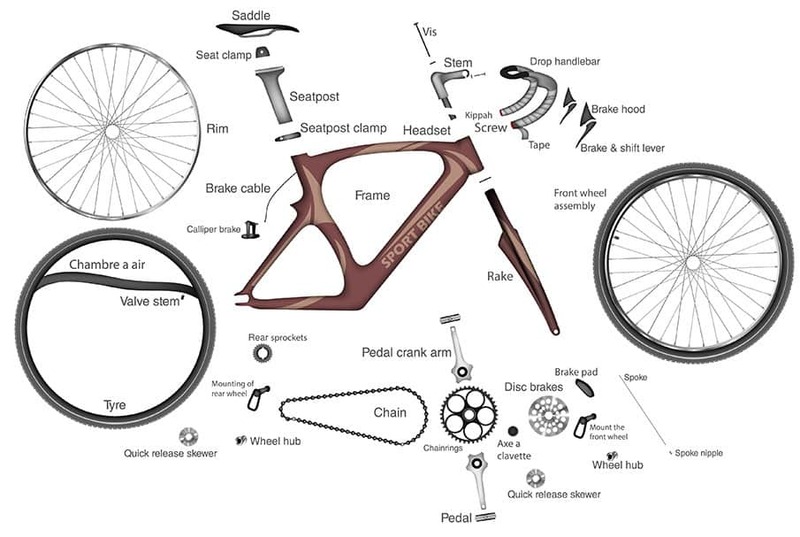 ​There are a lot of parts on every bike—many more than you probably realize. And each of them has a name (many of which you likely aren’t familiar with). Eventually, you might learn them all. But in the beginning, you just need to know the basics. ​For example, understanding that the fork is the part of the bike that attaches your front wheel to your frame is important. You should know that when talking about bikes, most people will say “saddle” instead of “seat.” You should know where your stem and your seatpost are. But you don’t need to know a bottom bracket shell from a headset. Or be able to list the advantages and disadvantages of different types of brakes. Knowing the basics will help you talk about bikes and find the right bike for you, so focus on that first. ​To get started cycling, you’re going to need a bike. And while that sounds like an easy problem to solve, there are actually a few decisions to make. The first one is which type of bike to get. Let’s take a look at the three main types of bikes. You can also recognize a road bike by the “skinny” tires—they’re much smaller than the tires on a mountain bike or hybrid, because they’re only meant to go on the road. They can handle some light dirt or gravel riding, but anything beyond that is likely to cause problems. The fact that they’re not super versatile and that you need to be flexible and have a strong core to ride the more aggressive road bikes means beginners should think carefully about getting a bike in this style. Fortunately, there’s a sub-type of road bike called “plush” or “endurance” that aims to keep riders in a comfortable position over long periods of time. It still might be uncomfortable for some riders, but it’s going to be a nicer ride than a more aggressive road bike that’s focused solely on speed. One interesting option for riders who are interested in road bikes but that want a bit more versatility is a cyclocross bike. This is, basically, a road bike that has a bit more off-road capability. They’re made for grass, dirt, mud, and gravel. They can’t handle trail riding like mountain bikes can, but they’re fast on the road and won’t be stopped by a little off-road action. With all of that being said, if you’re planning on riding medium or long distances on the road, you can’t beat a road bike. Once you get the fit dialed in and used to riding on a tire that’s smaller than you’re probably used to, the feeling of flying down the road absolutely cannot be beat. Want to take your bike anywhere, both on-road and off? Read on. The fact that they’re not super versatile and that you need to be flexible and have a strong core to ride the more aggressive road bikes means beginners should think carefully about getting a bike in this style. Fortunately, there’s a sub-type of road bike called “plush” or “endurance” that aims to keep riders in a comfortable position over long periods of time. One interesting option for riders who are interested in road bikes but that want a bit more versatility is a cyclocross bike. This is, basically, a road bike that has a bit more off-road capability. ​They’re made for grass, dirt, mud, and gravel. They can’t handle trail riding like mountain bikes can, but they’re fast on the road and won’t be stopped by a little off-road action. ​You can also recognize a road bike by the “skinny” tires—they’re much smaller than the tires on a mountain bike or hybrid, because they’re only meant to go on the road. They can handle some light dirt or gravel riding, but anything beyond that is likely to cause problems. They’re made for grass, dirt, mud, and gravel. They can’t handle trail riding like mountain bikes can, but they’re fast on the road and won’t be stopped by a little off-road action. On the other end of the spectrum, we have mountain bikes. While they’re perfectly capable of riding on the road or on bike paths, they excel on rougher trails. They’re built more sturdily; feel very at home with big, knobby tires; and get you in a better position to handle the ups and downs of rocky trails. ​There are two main types of mountain bikes: Hardtail and Full-suspension. A hardtail is probably the kind of bike you’re used to: the frame is one piece of metal (or carbon fiber), with each tube bonded together. 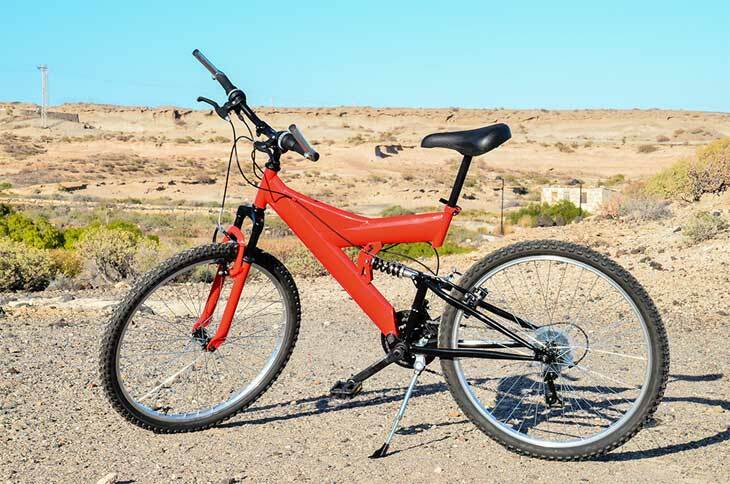 A full-suspension bike, on the other hand, has a shock in the middle of the frame, which allows the rear part of the bike to move up and down. This helps you ride on even rougher trails, and makes descending more comfortable (of course, there’s a trade-off in both weight and price). Do you need a full-suspension bike? As a beginner, probably not. Unless you live in the mountains and you want to take on gnarlier trails, a hardtail will help you learn the basics and get your technique down. 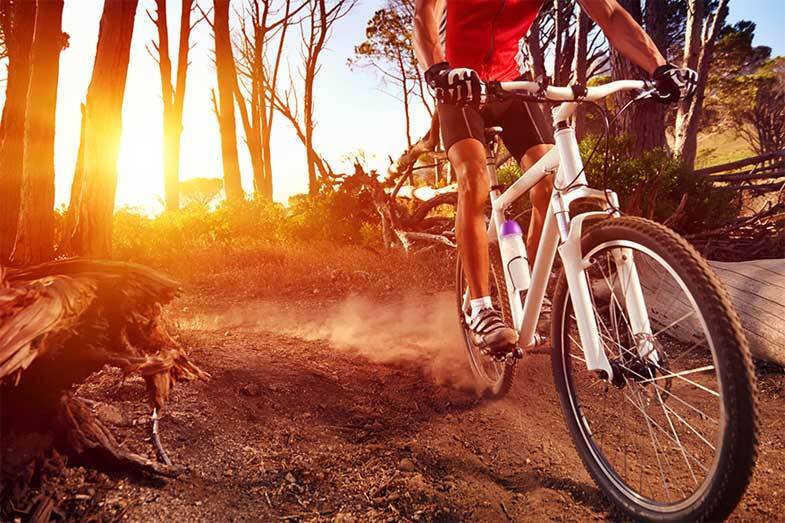 Almost all mountain bikes have front suspension that allows the front wheel to move up and down. This helps smooth out the ride and improve your traction. That’s what mountain bikes are all about: traction. You want to stick to the ground and be able to keep pedaling, no matter how rough the terrain. 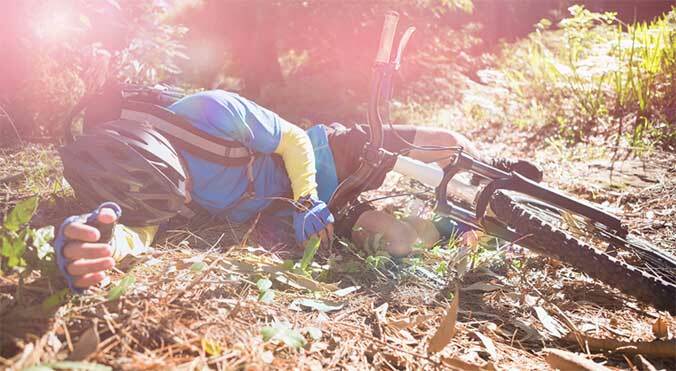 ​But all that stickiness comes with a price: mountain bikes are slow on the roads. There’s a lot of resistance from the wider tires, they’re heavier, and you aren’t in as good as position to generate lots of power as you are on a road bike. That’s where the final type of bike comes in. ​If you were to find a bike right in the middle of typical road and mountain setups, it would be a hybrid. These bikes combine the go-anywhere personality of mountain bikes with the efficiency of road bikes. They can’t handle the same trails as mountain bikes, and they won’t be as fast as road bikes. But they beat both on versatility. Hybrids tend to look more like mountain bikes: they have flat handlebars, a slightly more relaxed rider position, and wider tires than road bikes. But they also maintain the lighter frame of a road bike. Almost all beginners will be well-suited by a hybrid. Especially because there are hybrids for every type of riding: some are more focused on roads and paths. Others are meant for riding on dirt and light trails. Finding the right one for you depends largely on where you plan to ride. Fortunately, adapting hybrids to different conditions is simple. Another advantage that hybrids have is that they’re usually outfitted to carry things. Racks, panniers, baskets, and other accessories are easy to get on hybrids, and that lets you carry things to work, to the gym, or home from the grocery store. Finally, hybrids tend to be more affordable than specialized bikes. 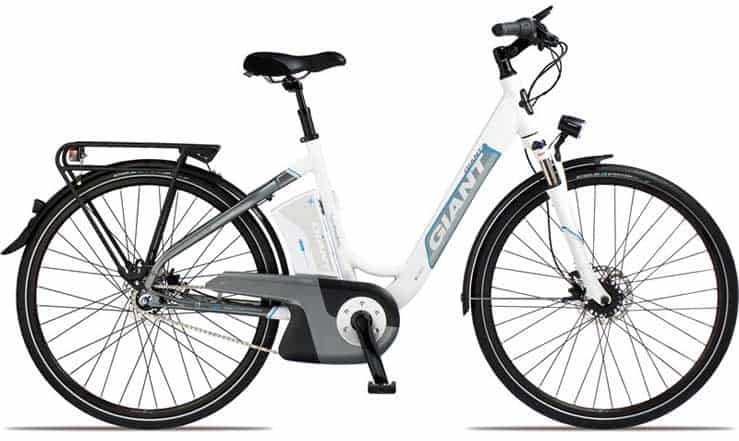 The combination of all those factors makes a hybrid a great choice for almost any beginning rider. These are the three main types of bikes. But we’re not done yet. If you were to find a bike right in the middle of typical road and mountain setups, it would be a hybrid. These bikes combine the go-anywhere personality of mountain bikes with the efficiency of road bikes. They can’t handle the same trails as mountain bikes, and they won’t be as fast as road bikes. But they beat both on versatility. ​Of course, this is only a very quick introduction to the kinds of bikes that are out there.Road bikes include racing, touring, cyclocross, and endurance models. There are cross-country, trail, all-mountain, enduro, and downhill mountain bikes. ......For example, include a small electric motor that helps you when you need a bit of a boost, like when you’re accelerating or going up a big hill. Foldable bikes are great for commuters who ride the bus or train. ​Cargo bikes let you haul tons of stuff without buying a lot of extra gear. Just remember that if you don’t see something that fits your needs, there’s almost certainly something out there that will be perfect. It’s just a matter of finding it. 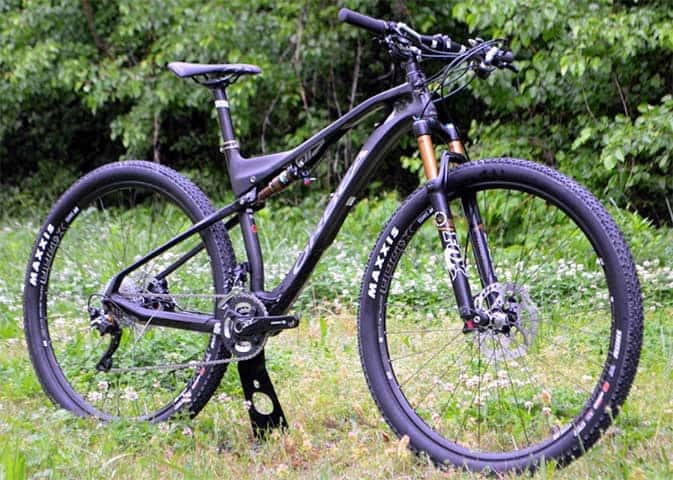 REI has a great breakdown of the different types of bikes and what you can expect from each. Now that you have an idea of the different kinds of bikes that are out there, you can start thinking about buying one. It can be an intimidating process, but if you keep these tips in mind, you’ll be set. Your best bet is to head straight to a bike shop and talk to one of the employees. They’re trained on how to help you find the best bike for your needs. ​​One piece of advice, though: decide on your budget before you start looking. You’ll be amazed at how much you can spend on a bike, and it’s easy to get caught up in all of the latest features and gadgets. ​Find a bike that suits your needs and your budget, and you’ll be set. ​One of the most common questions that people ask is about bike brands. Do some offer better value? In general, any large bike brand (especially Giant and Trek, two of the biggest brands in the world) offer a great value on all of their bikes. Other big brands like Specialized, Canndonale, Felt, and Fuji also get you a lot for your money. Smaller or more specialized brands like Bianchi, Pinarello, Intense, Nukeproof, and Pivot sell fantastic bikes. But they’re generally aimed at people who really know what they’re doing and what they want. They’re great bikes, but they’re expensive. Beginners should stick with brands that sell tons of bikes to many types of riders to get the best value. Beyond that, it’s a matter of test riding a handful of different models that fit your needs and seeing which feels the best. It can be tough to get a feel for which bikes best suit you when you only test ride for a few minutes. Still, test riding a few bikes is important. ​Do what you can to find some hills and corners, because that’s probably where you’re going to notice the bikes behaving differently. If you can, it’s a great idea to rent a bike for an extended period of time. Many bike shops will let you rent a bike for a day or two for a reasonable price. Some even let you take the price of the rental off of the price of the bike if you buy from them. If you’re able to rent a bike, take it out riding in the places where you’ll be riding most. That’ll help you get an idea of what the bike will feel like on your most common rides. Once you’ve chosen a bike, make sure to ask someone at the bike shop to give you a good fitting. The​ fit of your bike is crucial to your comfort, efficiency, and enjoyment. ​Sometimes employees will just adjust the seat and let you ride off—but there are many more adjustments that can be made. If you have to pay a little extra, like $50 or even $100, to get a full fitting done, you should. If you’re looking to save some money, buying a used bike can be a big help. But there are a few things to keep in mind to make sure everything goes off without a hitch. First, you’ll need to do more research to figure out exactly what kind of bike you want. You won’t have a bike store employee to help you figure that out. Beyond that, the idea is much the same. Test ride a few bikes, find out which one feels the best, and buy it. ​It’s also a good idea to take the bike into a bike shop to have the mechanics check it out before you buy it. They’ll let you know if it’s in good shape, if there’s anything that needs to be replaced, or if anything might post a danger. ​Buying a Bike Online—Is It a Good Idea? With the prevalence of online bike and sporting goods stores, it’s gotten very easy to buy a bike online. Places like Competitive Cyclist, Backcountry, and REI make it very easy to browse and buy bikes from your computer. But is it a good idea? If you know what you’re looking for, buying a bike online can be great. 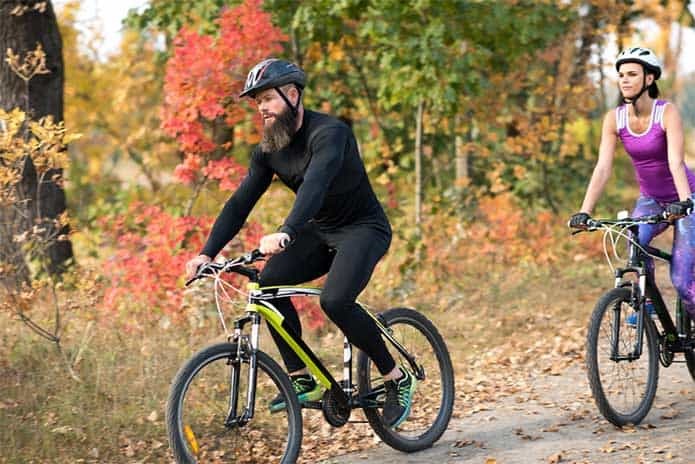 There are some drawbacks, though; you won’t get to test ride your bike, you won’t get a fitting, and you’ll have to be absolutely sure that you’re getting the right size. This is why it’s important to make sure the online bike shop you choose has a very good return policy. While it’s definitely possible, buying a bike online is probably not a good idea for new cyclists. Experienced cyclists know exactly what they need and in what size. But newcomers will be much better served by going to a brick-and-mortar bike shop. ​Bike fit is one of the most important things when it comes to cycling both comfortably and efficiently. If your bike is too big, too small, or adjusted poorly, you run the risk of injury. The best way to get your bike properly fit is to have a professional do it. However, if you can’t have that done, it can be difficult. ​Different bikes come in different types of sizes; mountain bikes sometime come measured in inches, while road bikes are often in centimeters. And both sometimes come in small-medium-large sizing. It’s not easy to get it figured out. eBicycles has a great fit estimator that you can use to give you a good idea, though. ​Just choose the type of bike you’re looking for, enter your height and leg length, and you’ll get ballpark estimate of the bike size you should look for. And once you’ve gotten the right size bike, you’ll need to go through a general fitting process. REI’s guide to bike fitting will walk you through the entire process. ​Once you’ve procured yourself a bike, it’s time to start riding. If it’s been a few years (or decades) since you got on a bike, it can be very intimidating. And that’s nothing to be embarrassed of. Despite the saying “it’s like riding a bike,” you can forget how to ride. But it comes back quickly. And if you’ve never ridden a bike before, it’s not too late to learn! Plenty of people​ learn to ride bikes as adults. Let’s talk about some issues you’ll need to deal with. ​The best thing to do is to take it slow. Start riding around a flat parking lot with your seat lower than normal so you can easily put your feet on the ground. Get used to the feeling of pedaling and coasting. Practice applying the brakes lightly. When you feel comfortable with that, raise your seat so your legs are almost straight when you’re at the bottom of your pedal stroke. Then start shifting. It can take a while to learn (or re-learn) to ride a bike. There are a lot of things to remember and most of them will become automatic—but until they do, it’s easy to forget things. Just keep practicing, take it slow, and don’t be too hard on yourself. you’ll find things that you’re afraid of. Maybe it’s riding in traffic. Maybe it’s tackling a particularly difficult descent on a local trail. Or maybe it’s shifting your front derailleur for the first time. The best thing you can do is to take it slow, practice regularly, and work up to any new challenge. ​Once you have the basics down, you’re officially a cyclist! And now it’s time to start improving your fitness and your skills. Fortunately, the best way to do both is simple: ride a lot. ​The more time you spend on your bike, the better you’ll become. Your fitness will improve, you’ll gain more skills, and you’ll get more comfortable with the various facets of riding. There are a few more things you can do that will help you improve your cycling, too. riding with people who are more experienced will help you improve very quickly. Trying to keep up with faster riders will drastically improve your fitness, especially on the road. Riding with mountain bikers who are more skilled will help you see how to boost your skills. Even just going on relaxed rides with friends who have been riding longer than you have will have a positive effect on your cycling. Finding a group to ride with is easy. ​The first place to look is your local bike shop—they often organize rides with groups of varying skill and fitness levels. Find the level that’s right for you, and join up for a few rides. It’s a great way to meet local people with similar interests, and the lower levels of the rides are usually very relaxed and beginner-friendly. There are also lots of meetup groups that you can get in touch with. The cycling section of Meetup.com is full of people who love riding their bikes, from absolute beginners to long-time experts. ........there’s always the possibility of convening your own group. Ask your family and friends who’d like to go for a ride. You might be surprised how many people take you up on it! ​If you usually ride on the road, try going for a trail ride! Or if you like to spend your time off-road, try going for a longer ride on the road. You might be surprised at how different these types of riding are. Even changing up your regular flat route to a hillier one will help you improve your cycling. —if you get comfortable with one group, going on a ride with another group that has a different riding style will be taxing. And that’s exactly what you’re going for. ​At some point, you’re probably going to want to get faster. Going fast on a bike is a lot of fun—especially when you feel comfortable doing it. But how do you get to that point? As I mentioned before, ride as much as you can. That’s really the key. But you can also practice the skills that make it easier to ride fast. For example, on the road bike, you’ll want to practice cornering and going down hills safely. If you can comfortably do both of those things, you’ll be much more comfortable when your speed starts getting into the 25–30 mph range. It’s similar on a mountain bike: practice staying loose and letting your bike bounce over obstacles. Then do it a bit faster. And a bit faster. Eventually, you’ll learn to let your bike handle rocks, roots, and anything else in your way without losing much speed. it’s all about practice and going slowly. Did you go 25 mph down that big hill behind your house last time? ​Try to hit 27 mph next time without getting wobbly. Did you ride your loop in an hour? ​Try to get down to 55 minutes. Keep pushing a little bit each time and your speed will steadily rise. ​Your first few rides in the rain, wind, or even snow can be nerve-wracking. ​And let me be clear: if the conditions aren’t safe, you shouldn’t be riding. ​If the roads are slick, it’s dangerous to be out on your bike unless you have the right gear. But experiencing these conditions can help you learn the skills you need to be a more confident rider. 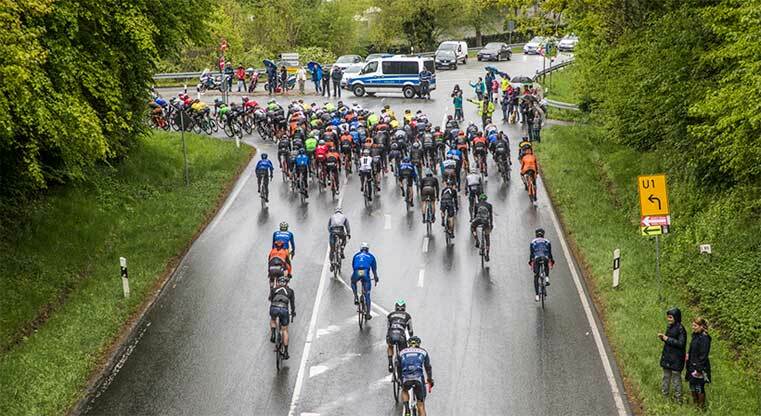 ​Next time you want to ride your bike, but it looks like rain, go anyway. Stay close to home, so you don’t get stranded, but don’t be afraid of getting a little wet. Then experiment with riding in the rain. Take corners carefully, and don’t slam on your brakes . . . but see how your bike behaves. The same is true of other conditions. Learn how to balance your bike when it’s really windy out, or to keep your mountain bike on track when there’s some snow on the trail. If you live somewhere that gets a lot of rain or other adverse weather, it might be worth investing in some bad-weather riding gear. Grippier tires, gloves, a cycling cap, and waterproof clothing will all help keep you warm, dry, and upright. There’s gear for riding in the snow, riding in the heat, and everything in between. ​Think you know everything about your bike? Think again. This is another thing that comes with experience, but you can speed the process along by doing some research. Different frames, groupsets, wheels, and other bike parts have specific advantages and disadvantages. For example, 26” and 27.5” wheels on mountain bikes are best suited for downhillers who need a lot of maneuverability. 29” wheels are more commonly seen on cross-country and trail bikes that need pedaling efficiency. Like anything in the bike world, this categorization is hotly disputed. Similarly, understanding how your suspension works and how to fine-tune it will make your mountain bike perform better. Choosing different types of tires can help you get the cornering grip and long-distance comfort you need on a road bike. Making small tweaks to your positioning on any bike can make a big difference. In short, spend time learning about your bike. The components, the kind of riding your do, positioning, bike-specific skills, and other factors can contribute to improving as a cyclist. Where do you learn these things? There are all sorts of options: reading online, taking local classes, chatting with mechanics at your bike shop, and talking to experienced riders are all great ways to learn more. ​Signing up for a cycling event is a great way to motivate yourself to ride more, meet new people, and accomplish something impressive. There are lots of great events for beginners—even if you aren’t an experienced cyclist or able to ride for dozens and dozens of miles, you’ll be able to find something that works for you. Charity rides are great for beginning riders; they aren’t timed, so no one’s tempted to ride. They’re full of other beginners. And they usually offer a variety of distances, from 15 miles up to 80 or even 100. Some rides encourage riders to raise money for a charity, while others put entry fees toward a good cause. Both Active.com and Bicycling.com have great lists of events for beginners. Local bike shops also post flyers and know about the upcoming events. If you want to hear specifics about how the ride went last year, or what you should do to prepare for the course, swing by your local shop. The best way to prepare is simply to sign up for one of a reasonable distance (probably something less than 50 miles), and start riding as much as you can. Practice eating and drinking on the bike, and try to spend a few hours in the saddle before the day of the race. Many events have recommended training plans that you can use, which will greatly help your preparation. And when you’re ready to take on a century (a 100-mile ride), make sure to prepare yourself for it. It’s not as hard as it sounds—but you will need to put in the work beforehand! ​Both on and off the bike, your diet can have a big effect on your riding. A comprehensive overview of cycling nutrition would fill at least one large book, but you get a basic idea from Cycling Weekly, Bicycling, and Active. In short, make sure you’re getting a balanced diet with plenty of carbohydrates and healthy, plant-based fats. When you’re on the bike, consume sugars and a lot of water to keep yourself going. ​Whether you’re preparing for a century ride or just tooling around the neighborhood, you’re bound to feel some pain eventually. Most of the time, it’s nothing to worry about. If your muscles are sore, especially the day after a longer-than-usual ride, you’re just getting stronger. No need to concern yourself. 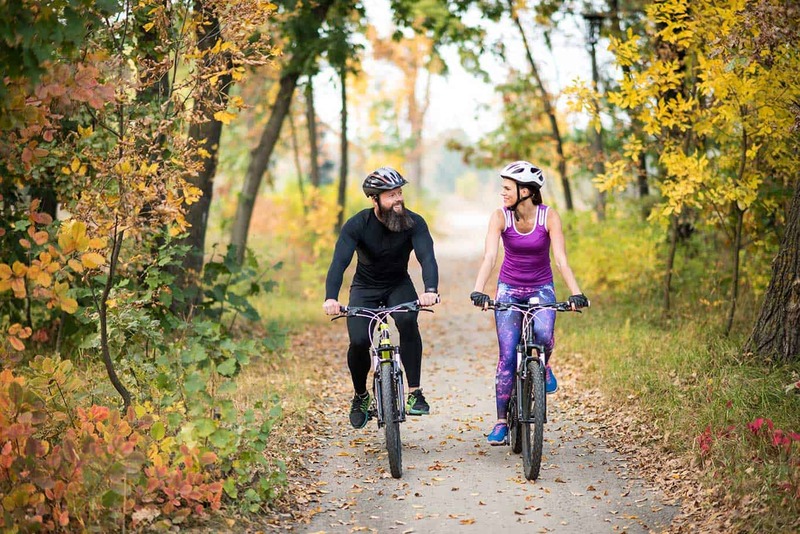 But if you’re feeling pain for more than a couple days—especially in a joint or connective tissue, instead of muscle—you should take a few days off of your bike. Ice the areas that hurt, and do some extra stretching. If that doesn’t help, it might be time to see a physician. They can take a look and let you know if you’ve injured something that needs attention. ​The best way to prevent injury is to have a bike that fits well. That means putting in the time (and money) to have a professional fit done. An experienced bike shop employee will make sure your bike fits you, and that goes a long way toward preventing injury. You’re almost certainly going to get injured at some point, even if it’s just some soreness that doesn’t go away quickly. ​In these cases, rest is your best option. Rest, ice, and see a doctor if the pain gets worse or sticks around for more than a few days. ​If you’ve started the bike shopping process, you already know that it’s easy to go overboard on accessories. There are tons of things you can buy to improve your safety or experience on the bike, but which ones are worth the money? ​​If you don’t want to invest in a computer or GPS, you can use a phone to track your rides. Each of these apps will help you keep track of how long and how far you ride, helping you build up your mileage and improve your riding. Speaking of apps, here’s something to keep in mind. Many people like listening to music while they workout. But using headphones while you’re on the road is very dangerous. Don’t listen to music while you ride. If you absolutely have to, only insert one earbud to make sure that your ear facing traffic isn’t blocked. And if you do listen to music while you ride, be sure to listen to up-tempo tunes that will keep you motivated and pedaling fast! ​Each of these apps will help you keep track of how long and how far you ride, helping you build up your mileage and improve your riding. ​When you’re just getting started, you don’t need many tools. A patch kit, some tire levers, and a portable pump will help you fix a flat tire when you get one on a ride. ​Beyond a patch kit and a pump, you don’t need many tools as a beginner. A small multi-tool will help you tighten up any bolts that have come loose during a ride. When you start working on your bike, though, you’ll want ball-end hex wrenches, a few screwdrivers, a pedal wrench, and a chain tool. ​I mentioned above that you should buy both a U-lock and a cable lock. This is to provide maximal theft protection for your bike. Most thieves are only equipped to deal with one type of lock, and using both makes your bike much less likely to be stolen. Always use at least one lock when you have to leave your bike someplace public—and use two when you can. Make sure that both your front wheel and your frame are locked to something secure, like a bike rack, a light pole, or a fence. Also, consider investing in higher-end security, ​like the Sherlock GPS bike tracker or the spybike. You can know more about how to lock bike from here. And if you bike ever does get stolen, report the theft to the police with your bike’s serial number. It’s hard to find a stolen bike, but it’s certainly not impossible! ​There are a lot of other safety-related things to keep in mind while you’re on your bike, too. First and foremost, always wear a helmet. This is the number one safety tip, and it’s one that many people ignore. Putting on a helmet only takes a few seconds, and it can save your life. Beyond wearing a helmet, most safety tips have to do with riding in traffic. ​Use the full lane when it’s not safe to be on the shoulder or in the bike lane. Make eye contact with drivers. Don’t ride the wrong way down the street. All of these things can help you stay safe when you’re riding in traffic. Most of them come down to being highly aware of your surroundings, ready to react, and skilled at avoiding obstacles. All of these come with practice. ​It also helps to know your local laws. In some places, for example, riding on the sidewalk is illegal. In others, it might be recommended in some cases. In most situations, bicyclists have the same rights as cars, which you should take advantage of to stay safe. Do you need to license your bike? Are you required to have insurance? Are you covered by your motorist’s or health insurance in the case of an accident on your bike? It also helps to know your local laws. In some places, for example, riding on the sidewalk is illegal. In others, it might be recommended in some cases. In most situations, bicyclists have the same rights as cars, which you should take advantage of to stay safe. There are a lot of other safety-related things to keep in mind while you’re on your bike, too. First and foremost, always wear a helmet. This is the number one safety tip, and it’s one that many people ignore. Putting on a helmet only takes a few seconds, and it can save your life. Beyond wearing a helmet, most safety tips have to do with riding in traffic. Don’t run red lights. Use the full lane when it’s not safe to be on the shoulder or in the bike lane. Make eye contact with drivers. Don’t ride the wrong way down the street. I mentioned above that you should buy both a U-lock and a cable lock. This is to provide maximal theft protection for your bike. Most thieves are only equipped to deal with one type of lock, and using both makes your bike much less likely to be stolen. Always use at least one lock when you have to leave your bike someplace public—and use two when you can. Make sure that both your front wheel and your frame are locked to something secure, like a bike rack, a light pole, or a fence. Also, consider investing in higher-end security, like the Sherlock GPS bike tracker or the spybike. And if you bike ever does get stolen, report the theft to the police with your bike’s serial number. It’s hard to find a stolen bike, but it’s certainly not impossible! Beyond a patch kit and a pump, you don’t need many tools as a beginner. A small multi-tool will help you tighten up any bolts that have come loose during a ride. When you start working on your bike, though, you’ll want ball-end hex wrenches, a few screwdrivers, a pedal wrench, and a chain tool. Speaking of apps, here’s something to keep in mind. Many people like listening to music while they workout. But using headphones while you’re on the road is very dangerous. Don’t listen to music while you ride. If you absolutely have to, only insert one earbud to make sure that your ear facing traffic isn’t blocked. If you’ve started the bike shopping process, you already know that it’s easy to go overboard on accessories. There are tons of things you can buy to improve your safety or experience on the bike, but which ones are worth the money? The best way to prevent injury is to have a bike that fits well. That means putting in the time (and money) to have a professional fit done. An experienced bike shop employee will make sure your bike fits you, and that goes a long way toward preventing injury. You’re almost certainly going to get injured at some point, even if it’s just some soreness that doesn’t go away quickly. In these cases, rest is your best option. Rest, ice, and see a doctor if the pain gets worse or sticks around for more than a few days. Whether you’re preparing for a century ride or just tooling around the neighborhood, you’re bound to feel some pain eventually. Most of the time, it’s nothing to worry about. If your muscles are sore, especially the day after a longer-than-usual ride, you’re just getting stronger. No need to concern yourself. But if you’re feeling pain for more than a couple days—especially in a joint or connective tissue, instead of muscle—you should take a few days off of your bike. Ice the areas that hurt, and do some extra stretching. If that doesn’t help, it might be time to see a physician. They can take a look and let you know if you’ve injured something that needs attention. Both on and off the bike, your diet can have a big effect on your riding. A comprehensive overview of cycling nutrition would fill at least one large book, but you get a basic idea from Cycling Weekly, Bicycling, and Active. Signing up for a cycling event is a great way to motivate yourself to ride more, meet new people, and accomplish something impressive. There are lots of great events for beginners—even if you aren’t an experienced cyclist or able to ride for dozens and dozens of miles, you’ll be able to find something that works for you. Charity rides are great for beginning riders; they aren’t timed, so no one’s tempted to ride. They’re full of other beginners. And they usually offer a variety of distances, from 15 miles up to 80 or even 100. Some rides encourage riders to raise money for a charity, while others put entry fees toward a good cause. Many events have recommended training plans that you can use, which will greatly help your preparation. And when you’re ready to take on a century (a 100-mile ride), make sure to prepare yourself for it. It’s not as hard as it sounds—but you will need to put in the work beforehand! Think you know everything about your bike? Think again. Your first few rides in the rain, wind, or even snow can be nerve-wracking. And let me be clear: if the conditions aren’t safe, you shouldn’t be riding. If the roads are slick, it’s dangerous to be out on your bike unless you have the right gear. But experiencing these conditions can help you learn the skills you need to be a more confident rider. Next time you want to ride your bike, but it looks like rain, go anyway. Stay close to home, so you don’t get stranded, but don’t be afraid of getting a little wet. Then experiment with riding in the rain. Take corners carefully, and don’t slam on your brakes . . . but see how your bike behaves. If you live somewhere that gets a lot of rain or other adverse weather, it might be worth investing in some bad-weather riding gear. 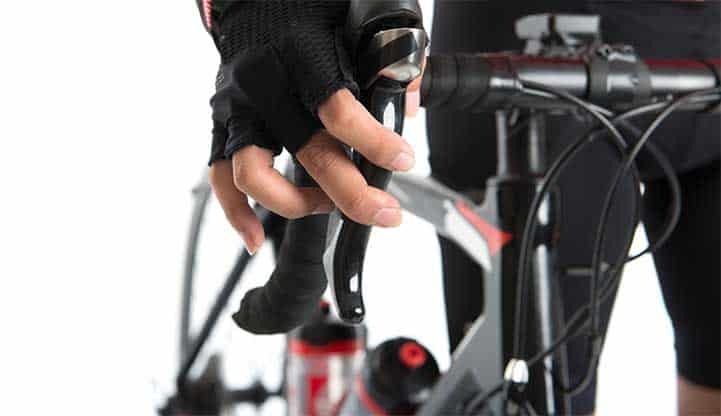 Grippier tires, gloves, a cycling cap, and waterproof clothing will all help keep you warm, dry, and upright. There’s gear for riding in the snow, riding in the heat, and everything in between. At some point, you’re probably going to want to get faster. Going fast on a bike is a lot of fun—especially when you feel comfortable doing it. But how do you get to that point? As I mentioned before, ride as much as you can. That’s really the key. It’s similar on a mountain bike: practice staying loose and letting your bike bounce over obstacles. Then do it a bit faster. And a bit faster. Eventually, you’ll learn to let your bike handle rocks, roots, and anything else in your way without losing much speed. Like anything else on a bike, it’s all about practice and going slowly. Did you go 25 mph down that big hill behind your house last time? Try to hit 27 mph next time without getting wobbly. Did you ride your loop in an hour? Try to get down to 55 minutes. Keep pushing a little bit each time and your speed will steadily rise. If you usually ride on the road, try going for a trail ride! Or if you like to spend your time off-road, try going for a longer ride on the road. You might be surprised at how different these types of riding are. Even changing up your regular flat route to a hillier one will help you improve your cycling. Riding with different groups is good, too—if you get comfortable with one group, going on a ride with another group that has a different riding style will be taxing. And that’s exactly what you’re going for. No matter what kind of cycling you like to do, riding with people who are more experienced will help you improve very quickly. Trying to keep up with faster riders will drastically improve your fitness, especially on the road. Riding with mountain bikers who are more skilled will help you see how to boost your skills. Finding a group to ride with is easy. The first place to look is your local bike shop—they often organize rides with groups of varying skill and fitness levels. Find the level that’s right for you, and join up for a few rides. It’s a great way to meet local people with similar interests, and the lower levels of the rides are usually very relaxed and beginner-friendly. And, of course, there’s always the possibility of convening your own group. Ask your family and friends who’d like to go for a ride. You might be surprised how many people take you up on it! Once you have the basics down, you’re officially a cyclist! And now it’s time to start improving your fitness and your skills. Fortunately, the best way to do both is simple: ride a lot. The more time you spend on your bike, the better you’ll become. Your fitness will improve, you’ll gain more skills, and you’ll get more comfortable with the various facets of riding. The best thing to do is to take it slow. Start riding around a flat parking lot with your seat lower than normal so you can easily put your feet on the ground. Get used to the feeling of pedaling and coasting. Practice applying the brakes lightly. When you feel comfortable with that, raise your seat so your legs are almost straight when you’re at the bottom of your pedal stroke. Then start shifting. Above all, be patient. It can take a while to learn (or re-learn) to ride a bike. There are a lot of things to remember and most of them will become automatic—but until they do, it’s easy to forget things. Just keep practicing, take it slow, and don’t be too hard on yourself. No matter what your skill level is, you’ll find things that you’re afraid of. Maybe it’s riding in traffic. Maybe it’s tackling a particularly difficult descent on a local trail. Or maybe it’s shifting your front derailleur for the first time. Once you’ve procured yourself a bike, it’s time to start riding. If it’s been a few years (or decades) since you got on a bike, it can be very intimidating. And that’s nothing to be embarrassed of. Despite the saying “it’s like riding a bike,” you can forget how to ride. But it comes back quickly. And if you’ve never ridden a bike before, it’s not too late to learn! Plenty of people learn to ride bikes as adults. Bike fit is one of the most important things when it comes to cycling both comfortably and efficiently. If your bike is too big, too small, or adjusted poorly, you run the risk of injury. The best way to get your bike properly fit is to have a professional do it. However, if you can’t have that done, it can be difficult. Different bikes come in different types of sizes; mountain bikes sometime come measured in inches, while road bikes are often in centimeters. And both sometimes come in small-medium-large sizing. It’s not easy to get it figured out. eBicycles has a great fit estimator that you can use to give you a good idea, though. Just choose the type of bike you’re looking for, enter your height and leg length, and you’ll get ballpark estimate of the bike size you should look for. If you know what you’re looking for, buying a bike online can be great. There are some drawbacks, though; you won’t get to test ride your bike, you won’t get a fitting, and you’ll have to be absolutely sure that you’re getting the right size. This is why it’s important to make sure the online bike shop you choose has a very good return policy. While it’s definitely possible, buying a bike online is probably not a good idea for new cyclists. Experienced cyclists know exactly what they need and in what size. But newcomers will be much better served by going to a brick-and-mortar bike shop. Buying a Bike Online—Is It a Good Idea? If you’re looking to save some money, buying a used bike can be a big help. But there are a few things to keep in mind to make sure everything goes off without a hitch. First, you’ll need to do more research to figure out exactly what kind of bike you want. You won’t have a bike store employee to help you figure that out. Beyond that, the idea is much the same. Test ride a few bikes, find out which one feels the best, and buy it. It’s also a good idea to take the bike into a bike shop to have the mechanics check it out before you buy it. They’ll let you know if it’s in good shape, if there’s anything that needs to be replaced, or if anything might post a danger. Beyond that, it’s a matter of test riding a handful of different models that fit your needs and seeing which feels the best. It can be tough to get a feel for which bikes best suit you when you only test ride for a few minutes. Still, test riding a few bikes is important. Sometimes a bike just won’t feel right—it won’t fit your body, or it will feel strange when you take it around corners, or sluggish on the hills. Do what you can to find some hills and corners, because that’s probably where you’re going to notice the bikes behaving differently. If you can, it’s a great idea to rent a bike for an extended period of time. Many bike shops will let you rent a bike for a day or two for a reasonable price. Some even let you take the price of the rental off of the price of the bike if you buy from them. If you’re able to rent a bike, take it out riding in the places where you’ll be riding most. That’ll help you get an idea of what the bike will feel like on your most common rides. Once you’ve chosen a bike, make sure to ask someone at the bike shop to give you a good fitting. The fit of your bike is crucial to your comfort, efficiency, and enjoyment. Sometimes employees will just adjust the seat and let you ride off—but there are many more adjustments that can be made. If you have to pay a little extra, like $50 or even $100, to get a full fitting done, you should. It’s worth it. One of the most common questions that people ask is about bike brands. Do they matter? Which is the best brand? Do some offer better value? In general, any large bike brand (especially Giant and Trek, two of the biggest brands in the world) offer a great value on all of their bikes. Other big brands like Specialized, Canndonale, Felt, and Fuji also get you a lot for your money. Smaller or more specialized brands like Bianchi, Pinarello, Intense, Nukeproof, and Pivot sell fantastic bikes. But they’re generally aimed at people who really know what they’re doing and what they want. They’re great bikes, but they’re expensive. Beginners should stick with brands that sell tons of bikes to many types of riders to get the best value. One piece of advice, though: decide on your budget before you start looking. You’ll be amazed at how much you can spend on a bike, and it’s easy to get caught up in all of the latest features and gadgets. Find a bike that suits your needs and your budget, and you’ll be set. Of course, this is only a very quick introduction to the kinds of bikes that are out there. 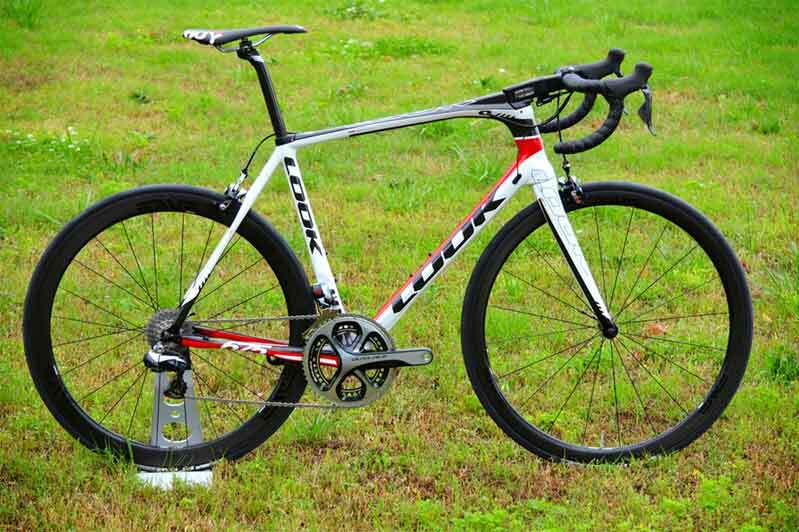 Road bikes include racing, touring, cyclocross, and endurance models. There are cross-country, trail, all-mountain, enduro, and downhill mountain bikes. Even hybrids come in different configurations and types. And there are even more. 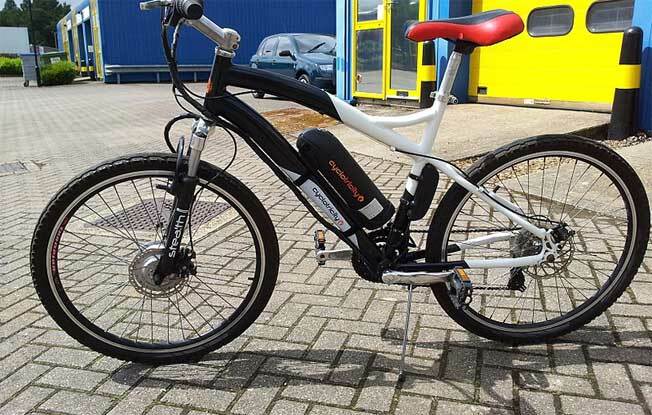 E-bikes, for example, include a small electric motor that helps you when you need a bit of a boost, like when you’re accelerating or going up a big hill. Foldable bikes are great for commuters who ride the bus or train. Cargo bikes let you haul tons of stuff without buying a lot of extra gear. Just remember that if you don’t see something that fits your needs, there’s almost certainly something out there that will be perfect. It’s just a matter of finding it. To get started cycling, you’re going to need a bike. And while that sounds like an easy problem to solve, there are actually a few decisions to make. The first one is which type of bike to get. Let’s take a look at the three main types of bikes. If you live in a country where most people don’t ride their bikes on a regular basis, all of this might seem a bit foreign to you. But it’s worth noting that Denmark, consistently rated one of the happiest countries in the world and one of the best places to live, is also one of the most bike-friendly places. A full 50% of Copenhagen’s residents bike to work or school on a regular basis. And, of course, there’s another factor that’s more difficult to quantify: riding a bike is fun. The pavement or trail under your wheels, the wind blowing against your face, the intense effort to get through a tough ride, the contentment from doing something good for yourself and the environment . . . it’s almost impossible to explain it to someone who doesn’t ride regularly. But it’s there, and it’s real. Riding a bike is much more environmentally friendly than driving, too. That’s great when you’re commuting on your bike, but what about if you still drive to work? Even then, your bike can help you decrease your environmental footprint. A quick ride to the library or the grocery store every now and then adds up. So does not driving to the gym for your workout. On a related note, cycling can save you money. Getting into the sport isn’t always cheap, but riding your bike requires a smaller investment than driving your car. You don’t have to pay for gas. Upkeep is cheaper. You can even save tax dollars by riding your bike. Pollution, accidents, congestion, and road wear all cost local governments money. By reducing all of those, you’re decreasing the financial burden on your city—which means you pay less in taxes. Numerous studies have also shown links between cycling and mental health. Even 15 minutes of cycling can help reduce stress. Cycling can stimulate the brain, helping improve memory, reasoning, and other cognitive skills. It even helps increase the connections between white matter cells in the brain, which has all sorts of neural benefits. With all of the other great sports and activities out there, you might be wondering why you should try cycling. Isn’t cycling the domain of rail-thin professionals that spend tens of thousands of dollars on their bikes? Well, that’s part of it. But the cycling world is so much bigger than that. People who are fit or unfit, young or old, new or experienced, can enjoy cycling. You can ride anywhere, from the neighborhood bike paths to the highest mountain passes. You can take a quick ride down to the grocery store or go on a months-long adventure. Why Choose Cycling? It Will Improve Your Life! Cycling is a great sport, and anyone can do it. You don’t need to be a fitness enthusiast, a long-time bicyclist, or even in decent shape to get started. That’s one of the great things about cycling: it can help absolutely anyone improve their health, have a positive impact on the environment, and pick up a fun new hobby. ​When you start riding your bike a lot, you’ll begin to notice that there are a lot of obstacles on the road. Potholes, tree branches, garbage, and all sorts of other things will get in your way. And you’ll need to learn how to stay safe around those objects. Fortunately, most of what you’ll need to do is simply keep a watchful eye out and swerve around anything that could damage your bike or cause you to wreck. That usually means a quick turn in one direction followed by a quick turn in another to stay on your route. But sometimes you’ll need more than a quick swerve. Learning to stop quickly (and safely) is a good idea, too. Lean back, and put equal pressure on both the front and rear brakes. You’ll come to a stop—though the faster you’re going, the longer it will take. A more advanced skill to learn is the bunny hop. With this maneuver, you’ll hop your bike over any obstacles in your way, from potholes to garbage cans (though bunny hopping more than a couple inches off the ground takes a long time to master). 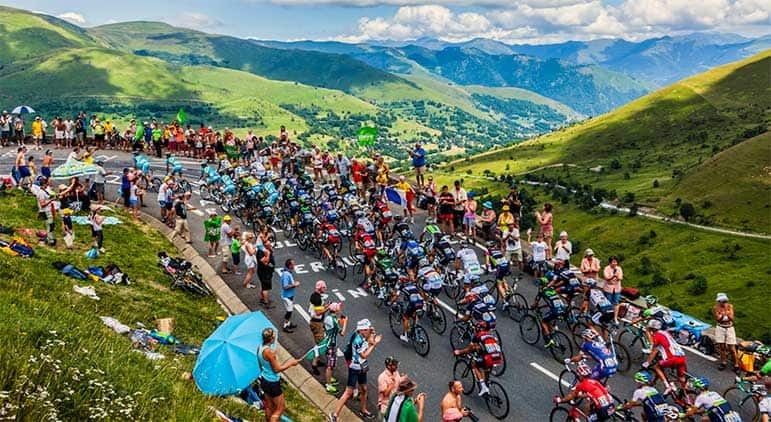 ​This guide merely scratches the surface of the the cycling world. There’s a huge amount of information out there, and learning to find it is part of the journey. When you want the answer to a question about cycling, and you can’t just ask someone who works at a bike shop or has been on a bike for decades, consulting the internet is your best choice. Below, you’ll find a list of links that will give you information about cycling. Everything from fixing a flat to the laws in your state. Feel free to ​send your own favorite resources! This guide merely scratches the surface of the the cycling world. There’s a huge amount of information out there, and learning to find it is part of the journey. When you want the answer to a question about cycling, and you can’t just ask someone who works at a bike shop or has been on a bike for decades, consulting the internet is your best choice. Below, you’ll find a list of links that will give you information about cycling. Everything from fixing a flat to the laws in your state. Feel free to add your own favorite resources in the comments! When you start riding your bike a lot, you’ll begin to notice that there are a lot of obstacles on the road. Potholes, tree branches, garbage, and all sorts of other things will get in your way. And you’ll need to learn how to stay safe around those objects. But sometimes you’ll need more than a quick swerve. Learning to stop quickly (and safely) is a good idea, too. Lean back, and put equal pressure on both the front and rear brakes. You’ll come to a stop—though the faster you’re going, the longer it will take. A more advanced skill to learn is the bunny hop. With this maneuver, you’ll hop your bike over any obstacles in your way, from potholes to garbage cans (though bunny hopping more than a couple inches off the ground takes a long time to master).